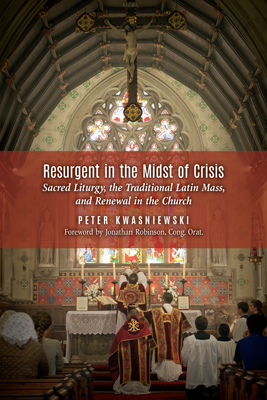 In this book, Peter Kwasniewski presents a fearless critique of the path of liturgical novelty and a detailed apologia for liturgical tradition in all its beauty, richness, and profundity, addressing such topics as solemnity, sacredness, the language of symbols, contemplation, participation, the symbiosis of lex orandi and lex credendi, silence, music, worship in Latin, and Gregorian chant. He confronts the humanism, rationalism, utilitarianism, and modernism so prevalent in the liturgical reform, assesses the prospects and limitations of a “Reform of the Reform,” and reflects on the great gift of Summorum Pontificum. In the end, Kwasniewski argues for a zealous recommitment to Catholic Tradition in its fullness, starting with divine worship and embracing the whole realm of faith and morals, including integral Catholic social teaching. Evidently, there is an all-encompassing crisis in the Church, which the Extraordinary Synod unveiled to a global audience. Unexpectedly a resurgence is taking place, with the usus antiquioror classical Roman Rite at the very heart of it. To those who have loved the traditional Mass all their lives, those who have newly come to it, or those who simply wish to learn more about the issues, this book offers abundant matter for reflection. Support the work of the LMS by becoming an '<a href=" www.lms.org.uk="" />Anniversary Supporter'. I do believe that the cover photo is St David's, Pantasaph! It does indeed! On the feast of Bl Edward Powell, the Welsh martyr, during the Summer School. The celebrant I'd Fr John Hunwicke.